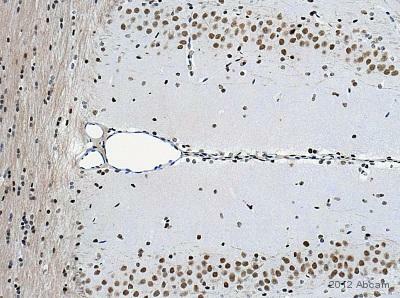 Rabbit polyclonal CNPase antibody. 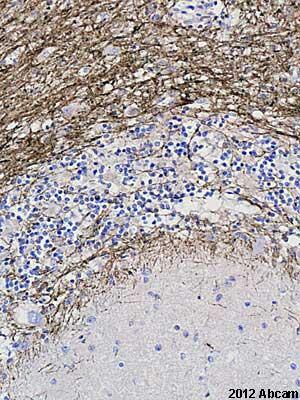 Validated in WB, IHC and tested in Mouse, Rat, Rabbit, Dog, Human. Independently reviewed in 4 review(s). Immunogen corresponding to synthetic peptide. Synthetic peptide conjugated to KLH derived from within residues 350 to the C-terminus of Human CNPase. 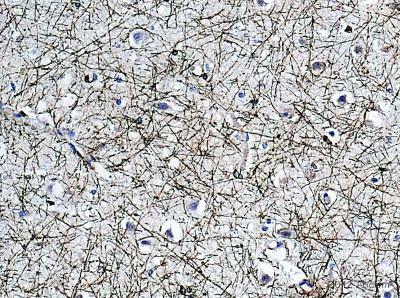 This antibody gave a positive signal when tested against Human, Mouse and Rat Brain Tissue. Our Abpromise guarantee covers the use of ab27695 in the following tested applications. WB Use a concentration of 1 µg/ml. Detects a band of approximately 46, 48 kDa (predicted molecular weight: 46, 48 kDa). Membrane. Melanosome. Firmly bound to membrane structures of brain white matter. Identified by mass spectrometry in melanosome fractions from stage I to stage IV. ab27695 recognises both isoforms of CNPase in human brain lysates. In mouse and rat brain lysates the antibody preferentially recognises CNP1 (46kDa). CNP2 (48kDa) is recognised, however the band is significantly weaker. All bands are blocked by the addition of the immunizing peptide, ab19424. ab27695 has not yet been referenced specifically in any publications. Publishing research using ab27695? Please let us know so that we can cite the reference in this datasheet. I have used ab27695 for western blotting against differentiated rat cells which express CNPase and I detect no bands. I have used another antibody from abcam, clone 11-5B (not sure of the product number), and this worked beautifully with the same samples in western blotting. I am sorry this product did not perform as stated on the datasheet and for the inconvenience this has caused. As requested, I have issued a free of charge replacement for one vial of ab109758 with the order number 946344. To check the status of the order please contact our Customer Service team and reference this number. Please note that this free of charge replacement vial is also covered by our Abpromise guarantee. Should you still be experiencing difficulties, or if you have any further questions, please do not hesitate to let us know. I wish you the best of luck with your research.